BowTech’s new PowerShift Technology works in concert with the PowerDisc to give the archer complete and total control of their draw cycle. The look is unmistakably BowTech: proportionately long riser despite the compact axle-to-axle length; short, way-past-parallel limbs and oversized binary cams. The Prodigy, though, is all about versatility. BowTech’s new PowerShift Technology works in concert with the PowerDisc to give the archer complete and total control of their draw cycle. Integrated into the Overdrive Binary Cam System, the PowerDisc, without the need of a bow press, allows the shooter to easily “shift” to each of three different draw-force settings. Setting number one, dubbed the Performance setting, was designed to provide maximum speed and knock-down power. Setting two, the Classic setting, ensures a hard-hitting but smooth draw, ideal for a treestand or ground blind. And for those who prefer a smooth-as-silk draw when frigid temps bite at the muscles, the number three Comfort setting doesn’t disappoint. Naturally, the Prodigy is loaded with other BowTech greats: the Center Pivot Extreme riser, FLX-Guard and Octane factory strings to name a few. At 32 inches axle to axle it’s a compact bow, and despite the friendly 7-inch brace height and 80-percent letoff, the Prodigy reaches a very respectable top speed of 343 fps when set at the number one Performance setting. Mass weight is moderate at 4.2 pounds. Peak draw weights are the standard 50, 60 and 70 pounds, and draw lengths run from 25 to 30.5 inches. Available finishes include Mossy Oak Break-Up Country, Realtree Xtra Green, Kryptek Highlander and BlackOps. Suggested retail price on this new BowTech flagship model is $1099. 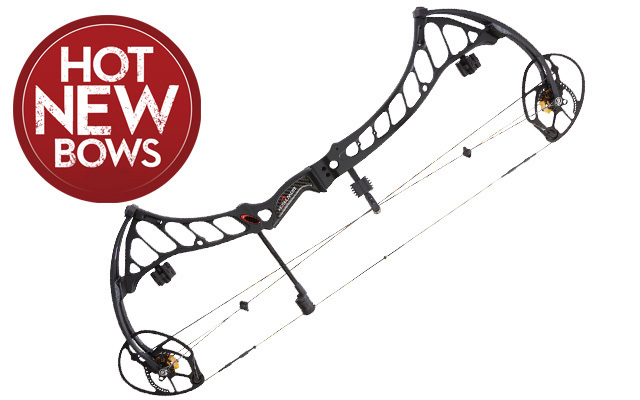 Also new for 2015 and also featuring PowerShift Technology is the BowTech Boss – a 36-inch axle-to-axle bow sure to please the long-draw bowhunter. The Boss features the Performance, Classic and Comfort settings via the PowerDisc. Some of the specs are the same, too, including the 7-inch brace height, 80-percent letoff and the 50-, 60- and 70-pound peak weights. Mass weight is marginally heavier at 4.6 pounds, but the biggest difference, longer riser aside, is the draw-length range, which starts at 26.5 inches and runs out to a full 32 inches. The top speed might be slightly lower than that of the Prodigy, but 333 fps still qualifies as fast. Finish options mirror the Prodigy, and retail price for the Boss is $1149. The 7.75-inch brace-height BowTech Fanatic showcases several advancements in riser design engineered to reduce – if not all but eliminate – torque and flex. Ideal for the competition crowd, the Fanatic hits a respectable 325 fps IBO/ATA speed rating, and the shoot-through riser places the grip in line with the pivot point of the limb and string aligned in the center of the riser. The Fanatic is available in a number of racy finishes and retails for $1,499. For more information, visit www.bowtecharchery.com or call (888) 689-1289.